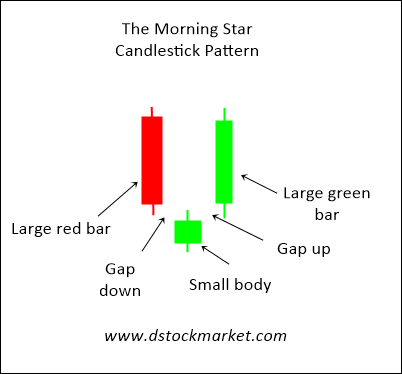 The morning star candlestick pattern is a bullish reversal pattern that tells traders that the stock is bottoming and about to reverse higher. This pattern can appear in stocks, indexes and even commodities. They often appear at the end of a downtrend and also at the end of a correction. When traders see this pattern, they often get ready themselves for a reversal to the upside in their stocks. The above picture is what the construction of the pattern looks like. First there will be a large red bar which is followed by a gap down and a small body showing slowing momentum to the downside. The next day, the stock gaps up and bulls quickly come in and push the stock higher forming a large green bar. The morning star is aptly named. It reminds me of our Lord Jesus Christ because Jesus is known as the bright and morning star which brings hope to the world. Therefore, the appearance of the morning star pattern in a stock or index brings hope to the stock. The chart above is the daily chart of Malaysian stock index FTSE KLCI. The index had a 3 days correction but it was forming a morning star candlestick pattern right at the rising 20 MA. This hinted of a reversal to the upside and from there the stock shot up for a week and subsequently went higher as the uptrend continued.